You can connect to an existing desktop session on your linux workstation with VNC. On the machine you are connecting from you will need a VNC client. We suggest remmina (linux), Real VNC Viewer (Windows, OSX). 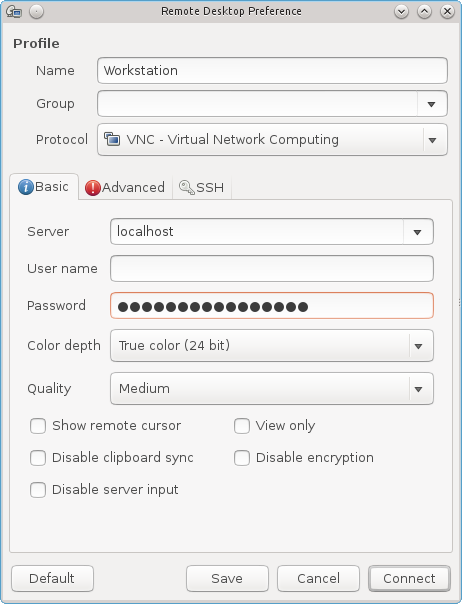 If you have an existing desktop session running on your linux workstation, you should be able to connect remotely to it with VNC. To do this, simply lock your screen before you leave it (Ctrl+Alt+L). # Set a VNC password (you should only need to do this once). Then just connect your vnc client to localhost. For the following commands you will need to substitude CRSID for your CRSID. You will also need to substitiute workstation.ch.private.cam.ac.uk with the fully qualified hostname of your workstation. You can obtain this by typing "hostname -f" in a terminal window. then start the VNC server and point your client at localhost. If you are trying to connect from a windows machine you may like to use putty to set up the tunneling. Under Session enter the following. Then under Connection->SSH->Tunnels enter the following and click on Add. and start the vnc server, then point your vnc client at localhost.